Chemical peeling is a technique used to improve the appearance of the skin. 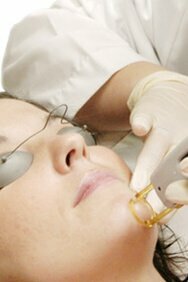 In this treatment, a chemical solution is applied to the skin to remove a layer or layers of skin. The new, regenerated skin is usually smoother and less wrinkled than the old skin. Dermatologic surgeons have used various peeling agents for the last 50 years and the type of peel best for your skin is going to be determined at your consultation. What may a chemical peel do? Chemical peels are best used to treat early photoaging changes: fine wrinkles, coarse skin texture, sallow skin tone, age spots and certain other pigmentary abnormalities may respond well. Besides stimulating younger appearing skin cells, chemical peels also enhance the penetration of other rejuvenating skin care products such as vitamin C serums, glycolic acid, hydroquinone, soluble skin growth factors, (TNS Complex) and retinoic acid. Each peel is individualized for each patient. May chemical peels help deeper wrinkles? Deeper and more severe photoaging changes are better treated with either a deeper peeling agent like, Laser Fractional Resurfacing procedures. Glycolic acid peels are generally preceded by two to three weeks of rejuvenating skin care products that are applied at home. The area to be peeled is cleansed and degreased and the appropriate concentration of glycolic acid applied and left on the skin for about 2 1/2 minutes before the acid is neutralized. A tingling to moderate burning sensation is expected but disappears when the peel is completed. Generally, a slight redness appears after the glycolic peel treatment that lasts hours to a day with a little extra dryness over the same period. It is almost always possible to return to work the same or certainly the next day. After 24 hours the home use of rejuvenating skin care products is resumed. This is a rejuvenation procedure that stimulates natural healing processes. A minimum of 4 peels is recommended at two-week intervals followed by maintenance peels at 4-month intervals. Daily sunscreen use is recommended, and specific types may be recommended. Salicylic acid peels are similar, but more intense, with slightly more discomfort, longer redness, and more actual dry peeling. Returning to normal activities is still possible after 24 hours. The Vitalize peel is our most intense peel, but still considered non-ablative: no significant downtime is expected. The peel does leave a yellow residue that is left on overnight before washing off. The yellow residue usually fades over several hours and make-up may be applied that day. The treatment is very effective for severe brown discolorations and sallow, sun-damaged skin. Three peels are recommended with the use of on-going rejuvenation products and advanced sunscreen with antioxidants. The Illuminize Peel from Skin Medica offers a new approach to improving your skin tone and texture. A superficial chemical peeling is produced using a new generation of alpha hydroxyl acids (Mandelic and malic acids) in combination with Phytic Acid, Salicylic acid and Resorcinol. The results maximum your skin rejuvenation with very low irritation. Great for people with sensitive skin. A series of 3 peels with periodic maintenance may maximize your long-term benefits. What should you expect after chemical peel treatment?